While relatively new as a snowshoe manufacturer, Atlas should be on you top priority list if you want a pair of well performing snowshoes. The company began its business in 1990 and has been a favorite place for many winter hikers and explorers to look for perfect gears ever since. 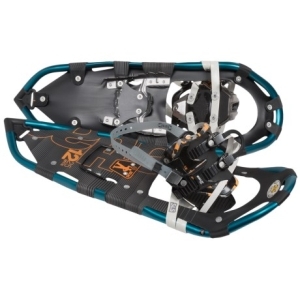 The types of snowshoes produced by Atlas range from budget friendly recreational snowshoes for fun trail walking to highly technical backcountry snowshoes for exploring more demanding terrains. Kids snowshoes and running snowshoes have recently been added to the company’s shelves too. So as you see it, there are plenty of snowshoes to choose from Atlas. 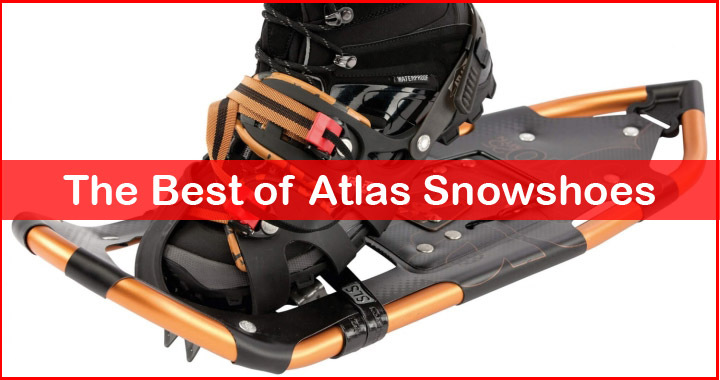 And in this post, we’re trying to give you better perspective by picking out three best Atlas snowshoes that simply have better performance as opposed to the others. What we like the most about Atlas snowshoes is that their innovative aluminum frames and decking always seem to be lighter than typical snowshoes. You might question their durability for this fact but don’t. Despite the lightweight construction, their snowshoes are just similarly solid as other snowshoes. They all sport Atlas’ proprietary V-shaped frames. The tapered tails at the rear help boost the wearer’s agility while also minimizing the amount of snow that’s got kicked up. All of the snowshoes mentioned above are the men’s or unisex versions. Atlas actually has pretty well known series of snowshoes engineered specifically for women called the Elektra. As much as we love them, we still decide to exclude them from the list. The reason is those who likely benefit from Atlas women’s specific snowshoes are the kind of women with petite physical figure. Besides, we’ve lately figured out that many female snowshoers feel more comfortable with the unisex models. Featuring semi-aggressive traction systems, Atlas 10 Series snowshoes are perfect for trail walking, day hiking and hut trips. These recreational snowshoes are designed for novice and intermediate snowshoeing fans. Their versatile applications range from groomed trails to moderate terrains. The crampons on these snowshoes bite deep enough to allow you to walk steadily on groomed trails. Even more than that, they’ll keep you sure-footed on fair ascent, should you want to challenge yourself and climb your way along intermediate backcountry access. They have the handy heel lifts too, which aren’t really common on recreational snowshoes. For those who don’t know, heel lift is that little steel bar that you can flip to provide better support on your heel as you go uphill, reducing calf fatigue considerably. The Wrapp Swift Bindings on Atlas 10 Series look quite different from any snowshoe bindings we’ve known. The straps are connected to large pads that cover most of the outer foot, leaving the inner foot exposed. Thankfully, it’s just an unusual appearance. In terms of ease of use and security, these bindings are incredibly safe and quick to adjust. The most interesting thing on these snowshoes, however, is the SLS system. In a nutshell, it’s a simple suspension designed to minimize the pressure on your front feet. While it does make a difference in the overall experience, the snowshoes become more prone to flinging snow at your back. You’re going to need some time to learn how to step without making the snowshoes kicking up snow. If you want to explore the off-trails from the get-go or simply want to replace your old backcountry snowshoes, Atlas 12 Series are the more appropriate option for you. They’re the beefed up version of the 10 Series designed to assist experienced winter explorers to stay sure-footed on technical terrains. On a glance, you wouldn’t notice any significant difference between Atlas 10 Series and Atlas 12 Series, which may make you wonder why the price margin are quite large. The two of them look almost identical really. The bindings, the heel lifts, the frame shape, the size options, and the arrangement of the crampons are all the same. However, once you get a closer look, you’ll understand why the latter deserves higher price tag. First off, the frames material is different. On Atlas 12 Series, the frame is made of 7075 aluminum which is the most rugged yet also the lightest metal alloy. On top of that, the decking is also constructed of Duratek that’s far more durable than Nytex. So when it comes to build quality, the 12 series are far superior to the 10 series. As for the crampons, they’re arranged in similar way on both snowshoes. However, in terms of aggressiveness, Atlas 12 Series have the upper hand. Both the instep crampons and heel crampons on these snowshoes pack more teeth to provide better traction on steeper hills and icy snows. Much like the 12 Series, Atlas Aspect is more suited for long distance hiking on backcountry terrains. They’re the latest brainchild of Atlas’ engineers, offering better traction and maneuverability through new crampons design. In contrast to the old models, the Aspect doesn’t come with large heel crampons. Instead, it sports a minimalist cleats bar underneath the decking. To help with the horizontal traction, the snowshoes are equipped with perimeter crampons that mimic the aggressiveness of a steel saw teeth. Meanwhile, the toe crampons at the front are just as solid as anyone can expect. From hard crusty snow to slick ice, they’ll bite deep into it giving you the firmest stance as you ascend and descend through steep sloped. The bindings on Atlas Aspect are more traditional, featuring three straps: one goes around your heel and the other two go over your front foot. These will allow you to sneak in bigger boots like mountaineering or even snowboard boots for better comfort. Other features are pretty much common to Atlas snowshoes: heel lift bars, SLS suspension, rugged frames and decking. 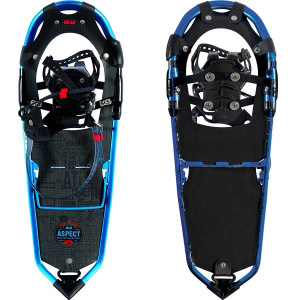 All in all, Atlas Aspect are excellent backcountry snowshoes with one of the grippiest traction systems currently. If I have to mention its shortcoming, it’s the flotation. 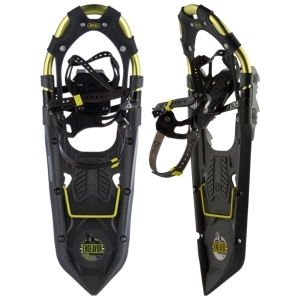 It’s by no means poor but compared to MSR Lightning Ascent and Tubbs Mountaineer, these snowshoes don’t perform the same as good on deep snow. Also, it’d be nice to have it equipped with instep crampons, instead of just huge toe cleats. Atlas Endeavor is an excellent performer on fresh snow. The molded plastic section at the rear of the decking provides extraordinary performance on fluffy situations. The glove-friendly bindings are also something worth a praise. The buckle-pin design can be adjusted quickly while also not compromising the security. It also accommodates various sizes of footwear, even those bulky winter boots. Sadly, the traction systems are so-so at the best. The crampons perform rather poor on some particular snow conditions (i.e. wet heavy snow) as they have the tendency to accumulate snow under the decking. In result, the traction will become lower and lower over time. In short, Atlas Endeavor is a good snowshoe for recreational use but its price tag is just too high. 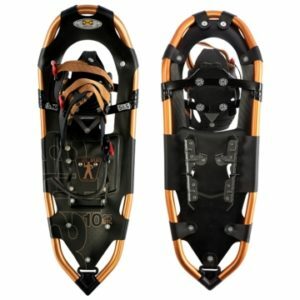 You can get snowshoes with similar performance for much less (like MSR Evo or Tubbs Wilderness).